The NEW Bulova Regatta Watch! Bulova Special Edition Latin GRAMMY timepieces. 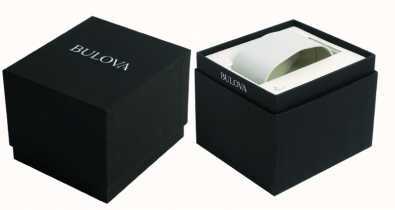 Authorised retailer for Bulova Watches. Free delivery, 30 day free returns and five-star rated service. Buy now with up to 12 months 0% finance. Bulova watches have a rich history and have been at the forefront of style and technology since they were founded 140 years ago. In January 2008 the company was purchased by Citizen. Combined, Citizen and Bulova are the largest watchmaker in the world. Whenever you buy a Bulova watch you know that you are getting a timepiece with impeccable style, great features and top of the range technology. Bulova was founded in 1875 by 23-year-old Joseph Bulova, who emigrated to the United States from Bohemia in 1870. In 1912 Joseph Bulova opened a plant in Bienne, Switzerland and produced his watches using standardized mass production which had never been seen before. Joseph Bulova's continued to develop innovations that added substance to the impeccable style of his watches. He also constructed the Bulova Observatory on top of a skyscraper to accurately measure astral time in order to accurately set all of Bulova's timepieces. In 1960 the Accutron range was released, this range used a tuning fork to to regulate time. This technology was used aboard NASA's Vangard 1 satellite 2 years before it was released to the public and was also used aboard Air Force One. The Bulova Precisionist range of watches are some of the most accurate watches on the planet. The technology inside addresses temperature change and vibration frequency, which are two critical factors which affect watch accuracy. The watch also includes a sweeping second hand rather than one which jumps each second, the sweeping motion of the hand is super smooth, running at 16 beats per second. Bulova watches come with incredible top-of-the-range technology, but they have not lost any of their classic style. TheBVA Series and Essentials Collection include watches with incredible features, at all price points which are impeccably stylish.